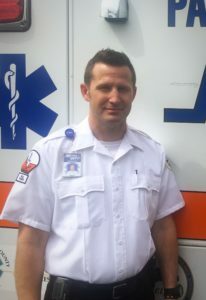 Jason is celebrating his 15th year working as a Paramedic Field Training Officer with Metro West Ambulance, and he is being nominated in recognition of his operational excellence and the consistency that he maintains as a field trainer. As a field training officer, Jason is always ranked as one of the top trainers by his Paramedic trainees. They regularly comment on how appreciative they are of his professionalism, his consistency in evaluation, and the detailed clinical and operational knowledge he shares with them. Jason is a consummate professional, focusing on listening first and then professionally guiding his trainee in the appropriate direction. This subtle yet firm teaching style has allowed his trainees to feel much more comfortable stepping into their new role of Paramedic in a busy EMS system. Jason is also a husband, father, and dedicated sports fan. When he is not busy training new Paramedics, he will be following his favorite basketball team or traveling to the latest EMS conference seeking more EMS knowledge. Metro West is proud to call Jason Fleming a Star of Life for 2018.